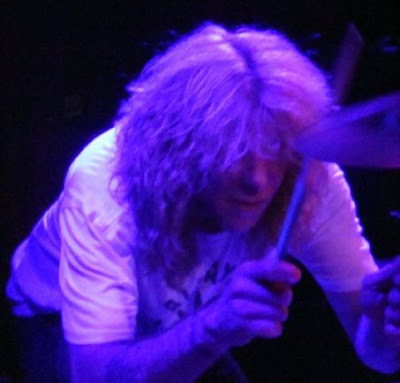 Asking Alexandria and ex-Guns N’ Roses drummer Steven Adler will join forces to perform songs from Guns’ classic ‘Appetite for Destruction’ album on Halloween at the Wiltern in Los Angeles. The set will be filmed for an upcoming DVD. While Asking Alexandria are best known for their mix of blazing metalcore and searing melodies, the band have a soft spot for ‘80s metal, as they revealed on their 2010 EP ‘Life Gone Wild,’ which featured covers of the Skid Row song ’18 and Life’ and ‘Youth Gone Wild.’ Ex-Skid Row singer Sebastian Bach joined the band onstage at the 2011 Revolver Golden Gods Awards on April 20 in Los Angeles and at this years Rock on the Range Festival in Columbus, Ohio, on May 21. Modern metal acts Winds of Plague, We Came as Romans, D.R.U.G.S. and Stick to Your Guns will also play the Halloween show with Adler’s Appetite and Asking Alexandria. Professional wrestler the Ultimate Warrior will join Winds of Plague onstage to perform his spoken word part from the band’s song “The Warrior Code,” marking the first time the Ultimate Warrior will take the stage in full costume with a rock band.